I’m a metal fan. The more extreme the better. Sure, I’m familiar with Pink and some of her more popular songs, and I think she’s really talented. I was planning on attending Satyricon, a black metal band from Norway on the night that Pink was in town. I got the call about 3:30 PM on the day of the show: “You are covering Pink tonight.” “OK, cool,” I thought. I arrived to spectacular floor seats that allowed my gaze to be on the giant stage with one very talented DJ and a giant pink backdrop. He looked tiny with his small table among the giant pink curtains. However, his sound was not small. He was successful in getting the crowd ready for Pink. Playing songs from may genres and eras, he was a good “time-filler” for what would be one of the most spectacular shows I’ve ever seen. Pink’s set time hit, and the pink curtain stayed up while “Here I go Again,” by Whitesnake came on the massive sound system. But it kind of sounded like Pink singing. I was kind of confused, and I put my video camera on play and waited. Waited for the curtain to drop…would it happen during one of the high notes that few can hit like David Coverdale? I waited. Nothing. The song completed. Hum…that was a little weird I thought. Then, BAM! The pink curtain dropped and Pink burst onto the stage, swinging from a chandelier affixed to the ceiling! It was awesome…glitter, sparkles, lights backlit Pink while she sang, “Get the Party Started! And the party started right then and there. Pink is one of those once or twice in a lifetime, rare performers, who has successfully bridged the gap between superstar and homegirl; best friend. 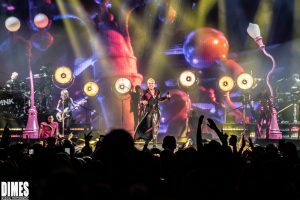 The theatrics, acrobatics, lights, extravagant set lists made you feel as if you were in a child-like state somewhere in the back of Pink’s imagination. Nearly at every turn, there were no less than 20 people on stage, all marvelously performing their very choreographed roles. There were many standout moments in the show for me, some of which raised the hairs on my arms in a gentle engulfing moment of emotion, and some even brought me to tears. I was awestruck by Pink’s raw but honed voice, mixed with her honesty about who she is both vocally and visually; it was truly magical. I loved all of the “girlfriends” and pods of women who came to the show together, many even sported pink tutus, pink wigs, and pink dresses! I thoroughly enjoyed seeing on either side of me (in the media row) the two male journalists who I peeked on out of the corner of my eye singing the words with a barely open mouth and swaying their bodies a tiny bit…not like a fan…more like a fan shackled in the grips of professionalism. I enjoyed when she stopped the show early for a minute after reading a sign from a fan. She put the mic down and grabbed a baby doll from the fan. She picked the mic b ack up and said, “Let me tell everyone what is going on so they don’t wonder,” and she read the loving note from the mother about her daughter who was fighting a form of cancer, and this doll was the daughter’s, and Pink was her inspiration. Pink dropped the mic again and signed it and lovingly handed it back to the mom. Another moment where Pink showed us her human-ness was when she walked to the end of the protruding stage and said, “Where is the 93-year-old lady who made the 400-mile trip to get to the show? The crowd roared, with an emphasis and massive finger pointing to a lady in the nosebleed section of the venue. The venue’s spotlight shined bright on the elder and pink said some nice words of appreciation and respect. Approximately every other song involved acrobatics that would challenge any circus performer, bordering on circ de solei quality. Pink is feisty, fit, fascinating, friendly, and a force to be reckoned with. Her casualness was really apparent when she came out dressed in an all-white outfit with many layers of gauze-like covering, and said: “This material is parachute material. I’m going to have to take off 13 layers of clothes…this material is hot…I guess I wasn’t thinking.” And then she proceeded to laugh at herself, revealing an outfit that any one of us girls likely have in our own wardrobe. She sang hits, with new songs spattered carefully between, and the crowd loved each and every song. Possibly my two favorite parts were when she introduced her band and when she expressed words and visuals of empowerment: I’d never seen such a great way to introduce a band. The giant screen displayed arrows pointing to each member as she said their name, and their name appeared in what must have been 15-foot letters. Later in the show, she introduce d her dancers with the same level of respect, with the last “crew member” being her daughter, and then Pink’s offspring sprinted across the stage into her momma’s arms. The other stand out part was when Pink did sort of a video timeline of her life, news clips, interviews, photos…both good and bad, and talked about empowerment. The very human element of it was when she said, her daughter came home from school and said, “I look like a boy. I’m the ugliest girl I know.” Pink said she made a PowerPoint for her daughter, and it appeared behind her on the giant screen in perfect synchronization to her powerful words: “Do you see me growing my hair”? “No mama.” “Do you see me changing my body?” “No mama.” “Do you see me changing the way I present myself to the world?” “No mama.” “Do you see me selling out arenas all over the world?” “Yes mama.” And a visual of those who lived their truth, waved their flag, and inspired the rest of us ensued. The next song was very powerful with a dark scary fantasy forest, and devil like predators. It was the most beautiful interpretation of the perception of female vulnerability, followed by a hoard of women from every walk of life walking towards her in a deliberately strong manner. Of course, Pink fought off the potential threat, visually showing us (and reminding us) that we are strong and we don’t have to be victims. It was at this point where I nearly cried. And hey, I’m an arms folded, non-dancing, death metal fan void of typical emotions. I was so touched by her humanness, her casualness, her talent, her outspokenness, her honesty, and her genuine love for her fans and life that I actually cared. It was at that moment that I realized how powerful Pink was, and a little bit of my feminine power resurfaced in me. I’m not sure there is any other artist who can touch her level of class, talent, vision, athleticism, and human-ness. She feels like one of us…untouched by stardom and fame. Pink’s “Beautiful Trauma” tour is definitely one of the shows to beat in 2018.